This page may require cleanup to meet basic quality standards. The specific problem is: Move external instructions on the wiki article itself. Host external files on the wiki. You can help by modifying the article. The discussion page may contain useful suggestions. 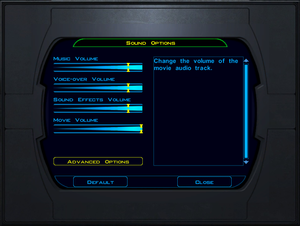 The soundtrack is stored in MP3 and WAV format, however junk data at the beginning of each file prevents them from being played back in media players. Run this script[Note 1] from the game's music directory[Note 2] to create standard music files that can be played back in most media players. Patch v1.03 is the latest patch (not required for Steam or GOG.com version). Delete or rename leclogo.bik, biologo.bik, and Legal.bik. Only 4:3 resolutions supported by default. See Widescreen resolution. Use Borderless Gaming with Auto-Maximize disabled. Be wary that Flawless Widescreen might cause a memory leak and corrupt your saves while saving/loading a save. Use Alt+↵ Enter to switch to windowed mode in game. Find RefreshRate under [Graphics Options] and change to desired value. Be warned, as using higher than 60 FPS tends to have several bugs associated with it such as the infamous "Stuck after combat" bug. Mouse pointer will use default Windows behavior. See below if you have any troubles. Controller is not natively supported. 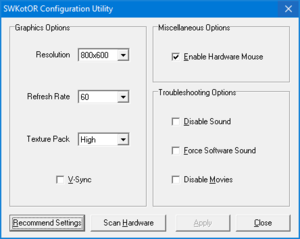 A Xpadder profile created by Heraske is available to use. It is approximately 90% full controller support that is nearly identical to the Xbox version. Also supports DS4 controller out of the box. Requires very minimal mouse movement. Runs just by opening Xpadder and the configuration with the proper profile; No file installation in the game data files required. Only available in Polish retail release. Not available digitally. Some users may have problems installing retail versions. Installation should be done with an administrator account for best results. Download and install the latest version of DirectX. Insert the game disc, and ignore any auto play screens. Open the Start Menu and click on “Computer”. 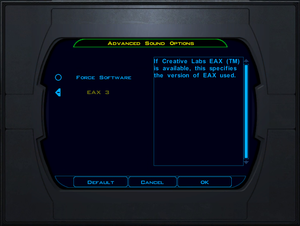 Right click on the disc drive that has the game disc and select “Explore”. Right click on setup.exe and select Properties. Click on Compatibility and select the options Run this program in compatibility mode for Windows XP Service Pack 2(SP2) and Run as Administrator. Run setup.exe and install the game as normal (recommended to install outside Program Files). Patch the game. Download the manual patch instead of using the game's auto updater. You can download the patch from LucasArts. Once the patch is downloaded, right click on the file, select “Properties”, and follow the same compatibility settings as done on “setup.exe”. 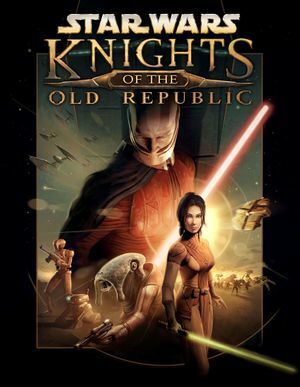 If you own the Star Wars: The Best of PC version of Knights of the Old Republic you do not need to patch the game. Right click on the folder, select “Properties”, un-check “Read-Only”, then click “Apply”. Download the SecuROM updated .exe file from here. This is for the US versions of the game. For international versions, go through the SecuROM support website. Rename the old .exe files before copying the updated ones in the installation folder. If you own the Star Wars: The Best of PC version of Knights of the Old Republic you do not need to replace the .exe. Right click on every .exe file in the installation folders and set the compatibility modes to the same as in step 4. Right click on the “kotor.exe” and select “Create shortcut”. Move the shortcuts to your desktop. If you are using a multi-core computer, you will need to set CPU affinity. Right click on the shortcut and select “Properties”. In the target box, type in: %WINDIR%\System32\cmd.exe /C start "SWKOTOR" /D "<path-to-game>" /high /affinity 1 "<path-to-game>\kotor.exe"
This shortcut needs to be set to “Run as Administrator”. However, the "Run as Administrator" box will be greyed out in the Compatibility tab; it must instead be ticked in the Advanced options under the Shortcut tab. To change the icon to the shortcut, click on “Properties” and then “Change icon”. A new box will open. Find the installation folder and select the game .exe. To prevent the command window from popping up briefly while launching, under the shortcut properties change the "Run" mode to "Minimized". Scroll down until you find “Graphics Options”. At the end of the graphics options section. This fix does not affect image quality, as Vertex Buffer Objects were just a mean of improving performance back then. 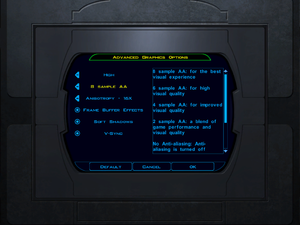 If the game crashes when a movie is played, you will need to enable support for the resolution 640x480 in your graphics card driver's control panel. Another solution is to play in windowed mode. This issue occurs due to poor support for older OpenGL implementations in several versions of AMD Catalyst Display Driver. Inside the installation folder, open swkotor.ini using a simple text editor (e.g. Notepad). Under [Graphics Options] section, change Frame Buffer=1 to Frame Buffer=0. Save the change and play. This negatively affects image quality. Download Catalyst Display Driver v14.4 for your version of operating system from AMD website (look for a link called "Previous Drivers and Software", usually located on the latest driver download page). Using 7-Zip or another compatible archiving utility, extract the downloaded driver exe file into a new folder. Inside the folder into which you just extracted the driver, do a search for a file called atioglxx.dl_ (yes, with an underscore). Using 7-Zip or another compatible archiving utility, extract the atioglxx.dl_ file. This will give you the final atioglxx.dll. Copy the newly extracted atioglxx.dll file into the installation folder, replacing the atioglxx.dll inside. This fix will not work on many GPUs, especially the newest ones. Hold down both the right and the left mouse button. 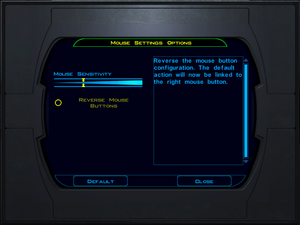 Press the quicksave button and keep both mouse buttons pressed during the whole saving process. Once the saving process is completed your can release both mouse buttons. The character should control normally again. If you encounter recurring issues with being unable to move your character, enabling Vertical Sync will greatly reduce the occurrences of this problem. Some users experience this issue after boarding the Ebon Hawk for the first time and are thus unable to progress past Taris. Save the file and continue playing the game, reverting the change once you've landed on Dantooine. The game can sometimes crash in two places. In the level "Prison Block", aboard the Leviathan, the game can crash when opening the detention cells (which hold the rest of your characters) and when activating the lift to go up to the bridge. Both of these crashes are fixed by rebooting your computer. Alternatively, changing the resolution to 800x600 may help if a reboot is unsuccessful. Disabling mouselook may also work. The game can also crash right after a shooting sequence right after the Leviathan level. This can be easily fixed by entering the door that leads to the hangar as the protagonist. Download the fix and follow the instructions. 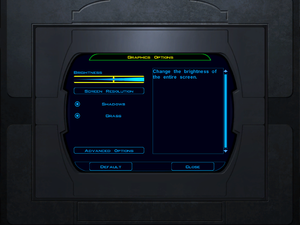 If using the widescreen patch, the game may display a black screen while playing cutscenes. Flawless Widescreen may not need this fix. 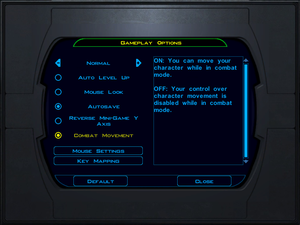 Go to game folder and right click swkotor.exe and under compatability run in xp mode and disable visual themes and scaling on high dpi. Restores small bit of cut content and fixes any remaining bugs. ↑ If using Windows, install Git for Windows to enable Bash scripts. ↑ It may be necessary to copy the music directory to your desktop. ↑ 3.0 3.1 3.2 When running this game without Administrator elevation, activity in %PROGRAMFILES%, %PROGRAMFILES(X86)%, and %WINDIR% might be redirected to %LOCALAPPDATA%\VirtualStore\ (more details). ↑ 4.0 4.1 File/folder structure within this directory reflects the path(s) listed for Windows and/or Steam game data (use Wine regedit to access Windows registry paths). Games with Steam Cloud support may store data in ~/.steam/steam/userdata/<user-id>/32370/ in addition to or instead of this directory. The app ID (32370) may differ in some cases. Treat backslashes as forward slashes. See the glossary page for details.